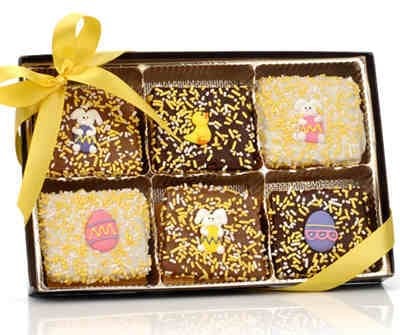 Wrapped in your choice of Milk, Dark or White Chocolate, these decorated Easter Graham Crackers are a great gift for all ages. These delicious Honeymaid® Graham Crackers are wrapped in your choice of decadently delicious Chocolate - Dark, Milk or White - and decorated with adorable hand crafted Royal Icing Easter Designs*. Individually wrapped in Cello Bags and heat sealed at both ends for freshness and quality; then hand packed in our Clear View Gift Box and finished with a lovely Bow to match. *Royal Icing Decorations may vary from those in photo.